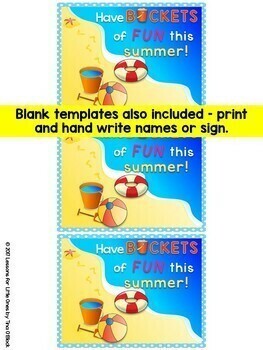 Easily create memorable & personalized end of the school year or graduation gifts for your students. Simply edit, print, and attach to inexpensive trinkets such as bubbles, sidewalk chalk, candy, balls, glow sticks, snacks, play dough, sunglasses, etc. Includes 24 different designs so you can use them for multiple classes or from year to year. 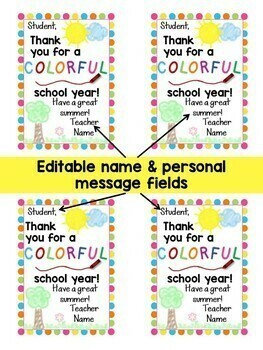 Also includes two versions of each set of end of the school year gift tags - one that has editable boxes for student names, teacher name, personal messages, and grade level (select tags only) and one that has no editable fields that can be easily printed out and signed by hand. Please note that the sayings on the tags are NOT editable. Please see the preview file for pictures of each end of the year gift tag. • Chalk it up to an amazing school year! (attach to a snack bag filled with a few pieces of sidewalk chalk). Includes both a girl and boy student gift tag. • You're a smart cookie! Good luck next year! (attach to a snack bag of cookies or a large, wrapped cookie). Includes a round student gift tag and a treat bag topper. "Best ideas and cutest designs. A MUST have!!!" - Kim P.
"This is an amazing pre-made source for all those cute additions you want to add to your student's experiences, especially at the end of the year. Very creative and well planned out with several options. Thank you!! " - Toni H.
"Super cute package! You get a wide variety of tags - all of which have adorable graphics-sayings-fonts! This was an enormous time saver. Well worth the purchase!! Thank you so much for sharing your creative ideas and hard work!" - Shelly P.
“My students & co workers LOVED all of these end of the year products last year! I was so happy with this product!” – Nina A. “OH, MY GOODNESS!! I'm so grateful for the variety!! The tags made my gift-giving even more meaningful and exciting. They are all so well done!” – Victoria E.
“Made my inexpensive gifts look great!” – Vicki T.
“I received many compliments about these from my colleagues, parents and students” – Rita R.
“These were ADORABLE and I plan to use them every single year...well worth the price!” – Holly E.
“So adorable, and worked out just right for my end-of-year note. Thanks for a super-cute and useful product that I would never have been able to create!” – Joy A. “Thank you so much for these tags! There was a perfect one for everything we included in our student's end of the year gift bags. These are professional and crisp, perfectly preschool - I love them! Thank you!” – Kate M.
“This is an end of the year life saver! So many gift ideas for students. All I have to do at the end of the year purchase the gifts and I'm ready to go!” – Cora K.
“This is great! I love how cute all the options are, makes gifts very easy, which you need at the end of the year! I also like that I can use this for years to come with new options. Thank you!” – Emily S.
“This is a great file to always have on hand!! 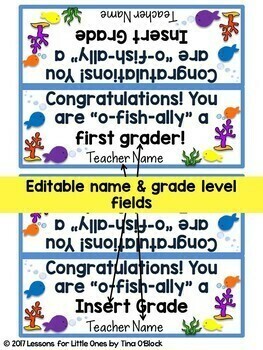 I love these for my classroom or to use as a parent for gifts. Thanks! !” – Jessica B. 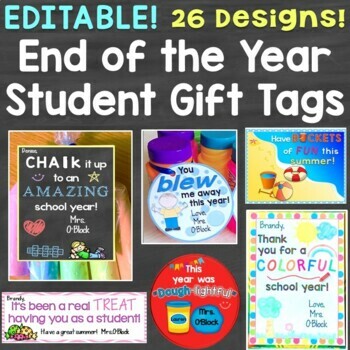 "The tags and labels look amazing on the gifts for my students!!!!! :) This made end of the year gifts so easy!!!! " - Melinda W.
•	CLICK HERE to become a follower. You will now receive email updates about this store.